Telangana D.Ed first Year 2019 Results: Telangana State Government, Director of government examinations(DGE) board issued the D. Ed first year, annual examination schedule notification in the month of January and this year D.Ed first year public examinations May /June 2019 were conducted successfully by the board of secondary education(BSE) Telangana State as per given their schedule. These examinations were started as per its schedule in May /June, 2019 and exams were held from 9 AM to 12.00 Noon. Fresh candidates and failed Failed candidates that means old batch of students also were attended in these examinations. We have known that, this is the first time, these exams were conducted by the newly formed Secondary Education Board of Telangana State. The Candidates who were appeared for the Diploma in Education(D.Ed) Course first year annual Examinations May/June, 2019, they are waiting for their results. The Board of Secondary Education(BSE) Telangana State officials are going to complete the evaluation process of D.Ed first year annual exams, 2019 in this month or May/June be next month. When the evaluation process was completed, The results of D.Ed I Year will be uploaded on BSE Telangana Official website by BSE Officials. 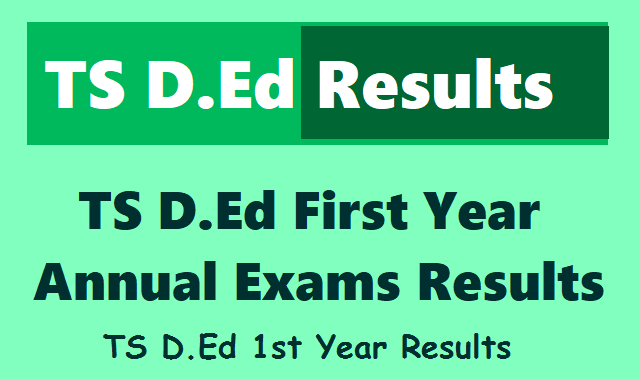 Telangana D.El.Ed 1st year Results April 2019: The results of D.Ed 1st year 2019 will be declared in the month of May by Directorate of Government Examinations(DGE and BSE) Telangana. A total of 15426 members appeared for the exams which took place in November last year, Of them 14260 candidates have cleared the test. The pass percentage is 92% according to an official in education department. when is the ts ded first year results we can see?pls tell me. sir.ded 2nd year lo grace marks vuntaya sir.tell me sir. Sir.....TS D.el.edu 1st yr results....when ?